Thank you LynDee for taking the time to stop by Community Bookstop and talking about yourself and your new book Lethal Lifestyles! 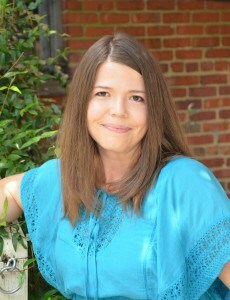 How did you come to write genre? I write what I like to read, for the most part: page turners with fun characters that tug at your heart and make you laugh, too. My protagonist, Nichelle Clarke, is smart and funny and loyal—all the things I look for in a good friend, so naturally I adore her. But close behind her is her sports columnist friend Grant Parker. It’s been such fun to watch his character grow and develop over the course of six books. 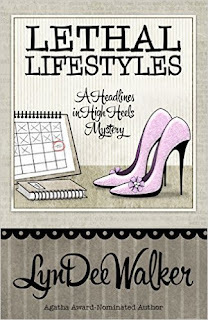 Lethal Lifestyles was great fun for me to write, because I got to spend a lot of time with Nichelle and Parker. I find inspiration in all sorts of places, from a creepy locale that would be the perfect Richmond body dump scene, to news stories, to someone mentioning a weekly polo match in the Virginia countryside. But my family is the reason I open my computer and work on days when I’m not feeling it: I realize how blessed I am to be home with my littles and able to do this thing I love. They are my best inspiration. Laundry. I wish that were more of a joke, but three kids with busy school and sports schedules produce dirty clothes by the boatload. All kidding aside: probably the same stuff y’all do when you’re not at work: I play with and read to my littles, volunteer at their schools, spend time with my darling, hang out and drink coffee with my girlfriends, hit the gym a few days a week…you know, suburban work-from-home mom stuff. Oooooh, I love this! A Costco-size box of matches, because I have tried and failed to generate a spark rubbing sticks together; a similarly huge box of tampons, because I read this super cool survival article about how you can use them to filter water and make it drinkable (I keep trying to find a way to work that into a book, but so far I haven’t found a place to get Nichelle quite that lost in the woods. Maybe next time); and my worn old copy of Harry Potter and the Deathly Hallows. It’s my favorite Rowling book, and it’s the longest of the series so it would take the most time to read. Thanks so much for having me today, Paula! This was fun! The pleasure was mine thank you for stopping by LynDee! 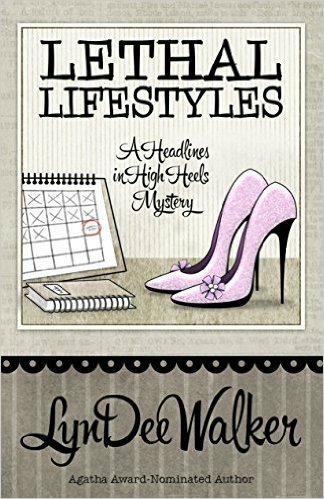 LynDee Walker is the author of the national bestselling Headlines in High Heels mystery series, beginning FRONT PAGE FATALITY (2013).